Psychologist Dr. Henry Grayson in his Westport therapy office. WESTPORT — It takes a long time for society to accept a new scientific viewpoint, but for the past half century, resident Henry Grayson has sought to hasten the belief in the power of consciousness, which he said is based in the science of quantum physics. “With Newton, the only thing that’s real is what you can measure or observe with the five senses. But, in the world of quantum physics, it’s consciousness that rules over matter, not the other way around,” Grayson said. Grayson, a 30-year Westport resident, first discovered the power of consciousness when he lived in Boston as a young graduate student and realized he could eradicate the symptoms of an oncoming sickness by finding the psychological roots of each symptom through questions such as, “Why might I need this symptom now?” he said. “I used to get colds and sore throats several times a year, every year. I’ve not had once since. It’s been decades,” Grayson said. 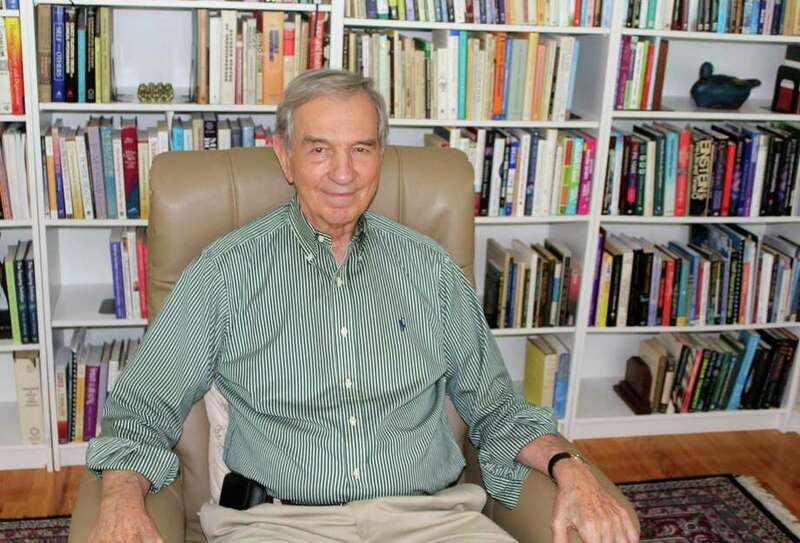 recognized consciousness psychotherapy expert, and his journey began in the deep South. Raised in tiny towns in Alabama and Florida, Grayson wanted to rebel against what he called his “narrow” Methodist upbringing. But he went to the same Christian college — Asbury University in Kentucky — his parents attended because they wouldn’t pay for another anywhere else, and Grayson wasn’t willing to pay for school himself. Nonetheless, Asbury was a valuable time for Grayson because of a professor who recruited Grayson to join the debate team. “He made us learn to think for ourselves. That was a major turning point in my life because I grew up in the South, where you’re supposed to be conservative in politics and religion and racism and all that stuff,” Grayson said. The professor’s lesson in critical thinking took time to set in for Grayson, however, because after graduating from Asbury, he went to graduate school. “I ended up going to theology school at Emory University without ever remembering, signing up or applying. It’s just because that’s what everybody in my family did,” he said. Grayson planned to become a Methodist pastor like the men in his family until another professor, this time a professor of pastoral counseling, set Grayson again on his own path. In the course, Grayson saw how psychology could help people. Following theology school, he moved to Boston for the city’s liberal culture and to attend a psychology Ph.D. program at Boston University. After graduating, Grayson left for New York City, where he completed post-doctoral training in psychoanalysis and became a tenured professor at the City University of New York. He also founded the National Institute for Psychotherapy to teach the full spectrum of psychological treatment methods from fields as diverse as neuroscience, quantum physics and global spiritual wisdom. Although Grayson never became a pastor, he has built a congregation of his own through his books, audio series and as the resident psychologist on the Weight Watchers Magazine Show formerly on the Lifetime channel and on the weekly Progressive Radio Network show, “Mindful Living with Dr. Grayson,” he hosted for several years. Personally, he is content, but Grayson said he is concerned for today’s society. “We’re focusing mostly on the negative. It’s happening politically because (President Donald) Trump is very negative, but then on the liberal side we’re negative against him. Both are unproductive energy and destroy our culture and health. The real problem is the stress we’re creating,” which we have the power to change, Grayson said.